I bought this book on Kindle in July, because it was cheap and I wanted to read something else by the author. I read Room by Emma years ago, it must've been about 2011. I sobbed my way through it and then immediately lent it to my mother-in-law because I knew she'd like it. I really recommend it, although obviously it needs trigger warnings for abuse, sexual abuse, violence, things like that. 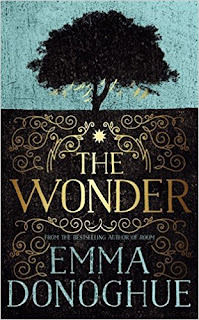 As for The Wonder, it starts off so differently to Room that to begin with it's hard to believe it's the same author, but by the end I definitely felt like it showed similar kinds of spirit. I want to read more by the author, I'll have to see which of her books appeal to me next. I got some book vouchers for Christmas so maybe that's what I'll buy! So, this novel starts with English nurse Lib Wright travelling to Ireland. The book is set in the 1850s, just after the Irish potato famine. Lib served in the Crimea under Florence Nightingale, so she's one of the 'newer' types of nurses, upright and rigorous in her nursing. To begin with, I found it hard to warm to Lib, but I liked her by the end of the book. She's going to Ireland as the employee of a committee set up to investigate the case of Anna O'Donnell. Anna is eleven, a devout Catholic, and supposedly hasn't eaten any food for four months. The committee wants to know if she really is a miracle and a wonder. Lib is at first dead set against the whole thing, and is sure someone must have been secretly feeding Anna. She feels herself to be the only voice of reason - even her nurse colleague is a nun and therefore of the same religion at the rest of the village. She starts to feel something towards Anna, though, and the two end up as friends. The beginning of the book is quite slow, but it really worked for the pacing and the whole slow atmosphere of the novel. I really liked it. I guessed a couple of the twists but that didn't detract from the whole. I'm giving this a five out of five because it's excellent.